We invite UT faculty to further your research and education efforts by utilizing the capabilities of NIMBioS. Let us help you build new initiatives at the forefront of scholarship. We are happy to meet with faculty individually or as a group to discuss what we might do to assist. For a current list of awards at NIMBioS through UT faculty, click here. Leadership. The experience of a Leadership Team that have not only been successful in managing the first major NSF-funded center-scale activity at UT Knoxville, but also have brought in over 20 externally-funded projects to UT Knoxville from a diverse collection of federal agencies including NSF, NIH, DOE, USDA, EPA, NRC, USGS and DOD. We are happy to discuss how we might assist in collaborative proposal development, for initiatives of all sizes, in ways that directly make use as well of our experiences as reviewers for many agencies. Staff. A phenomenally talented support staff who have enabled NIMBioS to receive consistently outstanding ratings from the well over 7,000 visitors we have supported over the past decade. We have the capability to deal with every aspect of logistics for any activity you’d like to develop, from small 10-person Working Groups, to major Conferences with over 200 attendees. Our logistics goal throughout has been to deal with all the details of managing meals, travel and lodging and allowing organizers of activities to focus on the science and education components of their project. Connections. A large network of connections around the world in quantitative and life science areas that can readily publicize your goals through our network of over 5,000 contacts and assist you in publicizing your successes in a variety of social and other media and through our professional science communication expert. Evaluation. Expert advice on choosing an evaluator appropriate for any proposal or project with this requirement, though the National Institute for STEM Evaluation and Research (NISER), which is part of NIMBioS. The NISER staff can also directly assist you by serving as your evaluator and composing the evaluation section for your proposals. Tools. A set of tools to assist spatial analysis of environmental systems including a drone that can collect photos and multispectral data at your project locations, a terrestrial LIDAR system, and expertise in software to analyze the data arising from these. The Spatial Analysis Lab (SAL) has a standard set of charges for its services that you can specify as appropriate in a proposal, use for one of your currently funded projects, or collaborate with NIMBioS in submitting a proposal that uses the SAL services. For those needing some support for modeling projects, NIMBioS is also developing the Mathematical Modeling Consulting Center. Although in its early stages, the MMCC is ready to help. Are you thinking of getting a project started that might benefit from modeling, but you’re unsure how to start? Please contact MMCC Director Nina Fefferman at nina.h.fefferman@gmail.com. Flexible Cost-sharing. For proposals submitted through NIMBioS, we will work with you to provide accounting and management as appropriate to your needs and develop with you and your unit an indirect cost sharing agreement that can potentially provide you more flexibility in planning your project than you might obtain otherwise. Researcher Talent Pool. 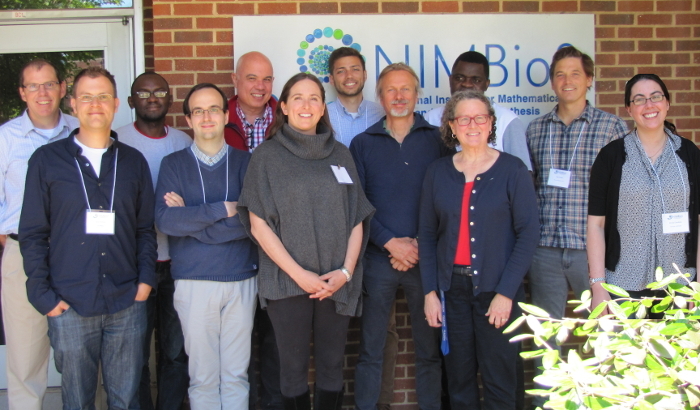 Through NIMBioS you have access to a group of highly successful quantitative researchers with broad skills in mathematical modeling, mathematical biology, spatial data analysis, data science, coding and high performance computing who can serve as collaborators on proposals or be consultants.